The story of Lebanese developer Paul Salameh is almost that story. He might not be a teenager (he’s 24) and his app might not influence the future of media consumption, but rumors have swirled that he has been offered a similar amount for its acquisition. “He’s been very successful, even by conservative estimation,” a local source told us, based upon estimates of downloads of the $1.99 iOS version and in-app purchases on its free Android app. For what? Pou. Yes, that’s the name of his app, which resembles a colorful, mobile version of Japanese digital pet Tamagotchi. In Pou, players can feed, wash, and play games with a brown, triangular alien pet, which has turned out to be wildly addictive; the app made a global Top 5 Paid iOS Apps list last month, sees between between 260-320,000 free downloads a day on Android, and has so far hit #1 in the iPhone kids games category in a total of 90 countries. With cute hand-drawn screens, a variety of custom games, and a lot of attention to detail, Pou is charming in a way that Tamagotchi simply isn’t. Bandai (now Namco Bandai), the company that originally built the very first hand-held Tamagotchi, is now feeling the sting of Pou’s success. For those of you that are too young to remember, Tamagotchi was an addictive digital “pet,” that you fed, played games with, and disciplined, to help grow it from an egg to an adult. It only had three buttons and a little LED screen on an egg-shaped device, but it kept kids enthralled before we had iPads. Now that it’s 2013, Namco Bandai seems stuck in 1996. They were surprisingly slow to develop a mobile version, and the one they launched recreates the L.E.D. experience of the 90s, not deviating from Tamagotchi’s original interface and features, with a terrible MIDI soundtrack. When Pou launched on Android last August and iPhone this November, it essentially cornered the market. By the time Bandai launched its Tamagotchi L.i.f.e app this February, Pou had already surged to #1 in kids’ games in the App Store in 65 countries. Now, Pou has not only brought that 65 to 90, it’s reached #1 overall in the iOS app store in 11 countries: Spain, Germany, Denmark, Austria, The Netherlands, Slovenia, Chile, Hungary, Macedonia, Iceland, and Estonia. In the U.S. App Store, it climbed to #1 for kids’ games on March 4th, and at time of print was still top in its category. Tamagotchi L.i.f.e. hasn’t ranked in any of those countries, according to AppFigures. With Pou’s engaging gameplay and dose of comedy (“How will YOU customize your POU?”, its app pages implore), Salameh is not worried about infringing on Bandai’s copyright. “Pou has been called Tamagotchi 2.0 by its fans, but I don't call it that. For me, it’s not really Tamagotchi. It's a different concept and they have all kinds of different creatures.” Thus far, he says, Bandai hasn’t contacted him with any concerns. Salameh’s success isn’t just a factor of being in the right place, with the right idea, at the right time, however. It’s also the result of Salameh’s obsessive focus on detail. What you might not realize when you play Pou is that the always-hungry character with the funny exclamation is based on Salameh himself, emerging from a playful joke. “It’s true,” he says. “My name is Paul, but my friends call me Pou.” Even Pou’s sounds are his own recordings. He left the talk 20 minutes after it started, and began building once his job contract ended in May last year. 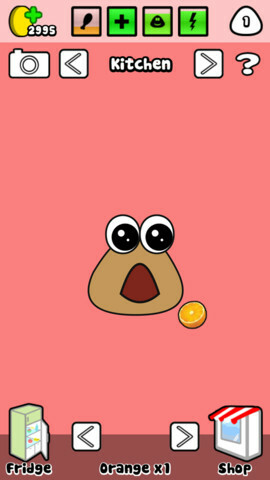 Since then, he’s continued to eat, sleep, and breathe, well, Pou. His story is almost reminiscent of the Sticky Weasel HSBC ad (below); Salameh is now completely dedicated to improving his global brand. “I'm just going to keep working on Pou or products related to Pou for at least two years,” he says. So does this mean we can expect to see plush Pou’s in Lebanon soon? Candy, clothes, toys, stationery, and collectible cards will launch in the U.S. and Europe. Deals with telecom companies in Europe will also see Pou pre-installed in some devices. What fellow developers might want to remember when watching the story of Pou is that Salameh learned everything he needed to know about coding by himself, online. “I just Google basic examples and build my code around them,” he says. “Always listen to your users.” In the first few weeks, he read every single email he received about the app. “Go out less.” Forget your social life and focus, he says. You’ll have to spend at least 6 months being a complete workaholic to launch something worthwhile. To see a Dutch adult try to make sense of Pou, see below. Remember this Sticky Weasel ad? This happens.